PLEASE NOTE: The newest collection of cloth diapers have addressed and rectified the concerns I, and other reviewers, had with the diapers. For more information, click HERE after reading this review. During the Green Family Giveaway event #gbgreenfam, I had the opportunity to review a cloth diaper from Glow Bug! I’ve heard many great things about Glow Bug and their diapers in the last few months, so I was excited to add one to our stash and try it out on my son. A Canadian company, Glow Bug was founded by Sarah Downey and Neta Talmor, two mothers and friends. After the birth of their children, they couldn’t find what they were looking for in cloth diapers, so they created their own affordable, well-made cloth diapers. Glow Bugs are a one-size pocket diaper, fitting most babies from birth to potty training (7-35 lbs.). Read more about pocket diapers here. 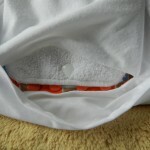 The four-size setting is possible through the rows of snaps on the front rise of the diaper. This diaper has double rows of waist snaps to allow a snug fit. The cross-over snaps on the waist are designed to fit newborns. 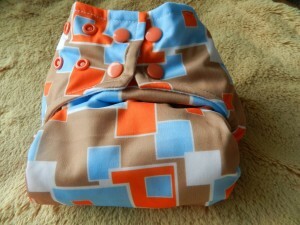 This diaper has waterproof PUL on the outside, and Glow Bug’s exclusive 100% polyester SlimDry material on the inside. SlimDry keeps moisture off baby skin without adding bulk. Each diaper comes with two inserts made with 70% polyester and 30% nylon microfiber. This diaper also has elastic at the back and double gussets around the legs. For newborns or babies with skinny legs, double gussets are a great feature. I can happily report that Mr. Stinky Pants did, in fact, test these double gussets. Yes, they do hold poo in the center of the diaper! Now obviously, depending on the amount of poo, the leg size of the baby, and the activities the baby is engaging in at the time…these all factor into how well a diaper holds in poo. But so far I have no complaints with Glow Bug, and we’ve been using it for several weeks now. This diaper has two openings (front and back) to add an insert. Each insert comes with a snap, and they snap into the diaper at the front. The pocket openings allow the inserts to agitate out of the pocket in the wash, provided they’ve been unsnapped beforehand. The back pocket opening and the front both have waterproof flaps. This helps keep moisture in the diaper where it belongs. Two things I’ve noticed about these inserts: 1. They’re narrower than most microfiber inserts. 2. They’re thicker than most microfiber inserts. For example, my FuzziBunz insert is about 5 1/2″ wide and the Glow Bug insert measured at 4 3/4″. 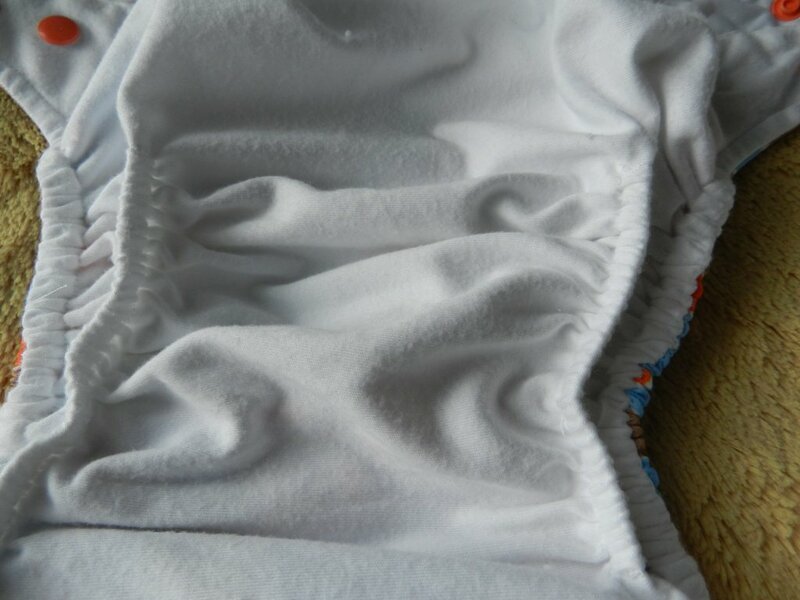 Interestingly, the actual pocket is wide enough that you could use a wider insert (like the FuzziBunz) inside. I could tell both by the feel and by “eye balling” the inserts, that the Glow Bug insert is thicker. This makes the diaper more absorbent, since it can hold more liquid. On the other hand, this insert takes longer to dry than my other microfiber inserts. In the below photo, my son is about 3 1/2 months old and 16 pounds. I’ve been snapping this diaper at the second row from the bottom (the Medium row). As you can see, he still has plenty of room to grow in this diaper. In fact, I could pull the top row of the waist snaps even tighter. What I really like about this diaper is how well it fits around the legs. He’s had no issues with “wing droop,” and I’m able to get a snug fit around his legs just by using the waist snaps. I have two mild, completely aesthetic concerns with this diaper. After my son pooped in this diaper, I placed the diaper in our dry pail, as usual. I washed this diaper the next morning, and the diaper was still badly stained after washing. Like I do with all my stained diapers, I placed this one in full sun. Every other pocket diaper I’ve done this with, the stains came out in a couple of hours of full sun. After two hours in the sun, the diaper was dry, and the stains looked barely better. I rewet the diaper and placed it in the sun again. This time, the stains did come out completely, but it was about a 5 hour process. But many moms may not care about stains. After all, the baby will just poop in them again, right? It’s a concern to me only because I’m one of those people that has to have a stain-free diaper, and there aren’t always going to be sunny days. My second annoyance is that the SlimDry fabric started pilling the second time I washed this diaper. Again, it won’t affect the functionality of the diaper. Conclusion: Overall, I’d give this diaper four out of five stars. For the price, the fit and features are great. Because of the staining issue and pilling, I’m not sure the SlimDry fabric is the best aesthetic choice for the inside of this diaper. I also think a wider insert may work better for older and larger babies. If the diaper came with two inserts in different sizes -narrow and wide- I think this would make the diaper more adaptable. My conclusion is no longer relevant! My concerns have all been addressed in the newest collection of Glow Bug diapers! Read about the newest collection HERE. …about Glow Bug cloth diapers? You could win an entire stash! Enter the Green Family Giveaway event’s grand prize here. Glow Bug diapers can be purchased from their Web site or select retailers. The print I reviewed is no longer available, but the new 2012 collection is available for pre-order with free shipping and will ship in October. They sell three packages: boy, girl, and spectrum (gender neutral). Each package is $150 for 12 diapers, 24 inserts, and a free wet bag. They also sell “booster” packages of 6 diapers for $70-75. Want just one diaper? Currently, Glow Bug is offering an individual limited edition “Snowflake Sweater” print diaper for $20! There is a limited number being made, so pre-order now! Glow Bug is also willing to work with co-op groups, so this is another great way for you to purchase one or two or however many diapers you need. 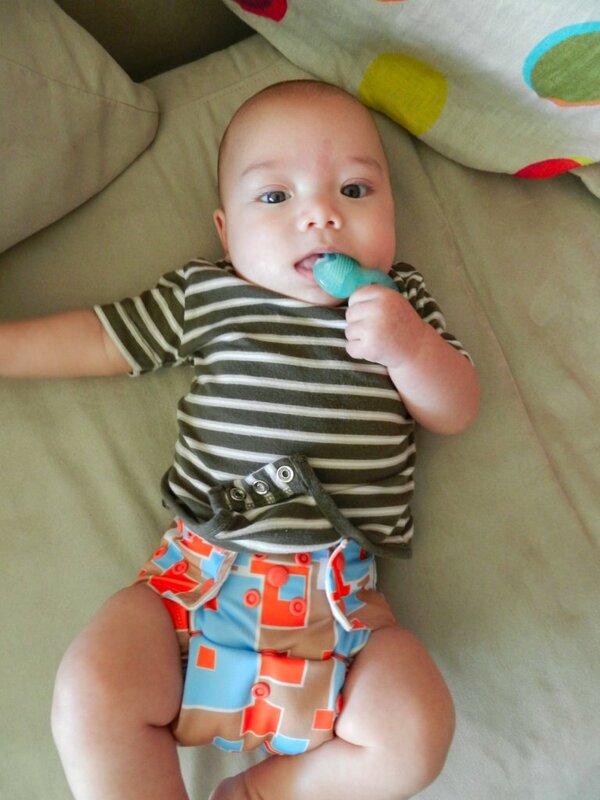 Note: I received a product sample from Glow Bug Cloth Diapers to facilitate my review as part of the Green Family Event. The opinions expressed are my own. Affiliate links present. A good morning so far!